Shop or dine at the Aloha Tower Marketplace (www.alohatower.com), an attractive and modern waterfront development in Honolulu. It is one of the major attractions in the area, with shopping plazas, restaurants, and pavement entertainers. Sail the tropical waters surrounding Hawaii on a skippered or bareboat charter, or crew on one of the America's Cup yachts berthed in Lahaina Harbour, Maui (www.sailmaui.com/). 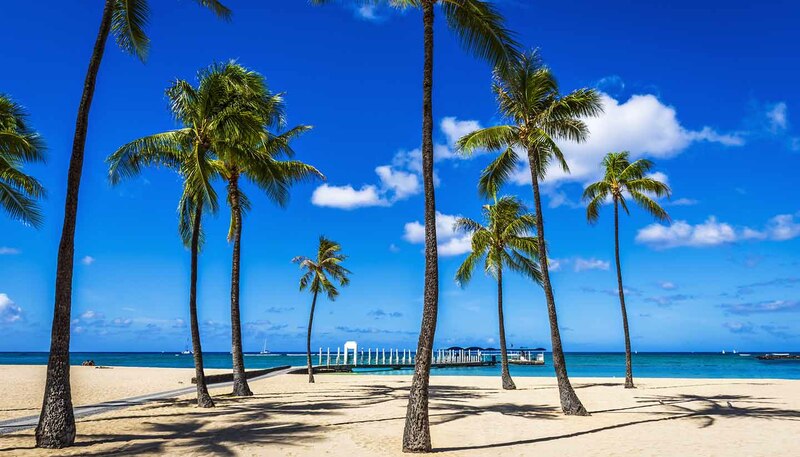 Take a full-day Circle Island Tour around Oahu, offered by several different agencies. Possible attractions en route include Waimea Falls Park (www.waimeavalley.net), Pearl Harbor, the Polynesian Cultural Centre (www.polynesia.com), Sea Life Park (www.sealifeparkhawaii.com) where you can swim with the dolphins, the Waialua Coffee Visitors' Center (www.waialuaestate.com) constructed on a former plantation, and Sunset Beach. Go deep-sea fishing off the Kona coast of Hawaii's Big Island. Snorkel and feed the tropical fish in Hanauma Bay (www.hanaumabay-hawaii.com), 10 miles east of Waikiki. Or swim with green sea turtles off the coast of Maui. Explore the Hawaii Volcanoes National Park (www.nps.gov/havo), one of the world's natural wonders. At 4,103m (13,677ft), Mauna Loa is the largest single mountain mass in the world, while at 1,200m (4,000ft), the still-active Kilauea's steaming vents and frequent eruptions provide an unusual (and safe) spectator sport. The volcano is continuously erupting, and lava can be seen hissing into the ocean. An island helicopter flight (www.helicopters-kauai.com) is the perfect way to view pristine forests, plunging waterfalls and verdant valleys. Join in the festivities of a Hawaiian luau. A whole roast pig is ceremoniously removed from a hot stone cooking pit and served with traditional Hawaiian fare, followed by a Polynesian pageant of authentic hula dancing. View the fine collection of Asian art at the Honolulu Museum of Art (http://honolulumuseum.org). Visit the Honolulu Zoo (www.honoluluzoo.org), home to over 1,230 mammals, birds and reptiles. The zoo is part of Queen Kapiolani Park, where the Honolulu Marathon is concluded annually. The entire 120-hectare (300-acre) park was created by King David Kalakaua in the 1870s and is listed on the state's Historic Register. Delight in the spectacular natural attractions of Lanai Island (www.lanaicity.com), including the dramatic Kaiolohia, also known as Shipwreck Beach, which sports petroglyph rock carvings, and the mystical Garden of the Gods north of Lanai City. Discover a weird and wonderful collection of rock forms in Maui's Ka'eleku Caverns (www.mauicave.com), located beneath the Hana Rainforest, where you can take a self-guided tour through this astonishing lavascape. On Molokai (www.molokai-hawaii.com) there are endless options for adventure. Visitors love to explore the quaint and colourful shops of the harbour town of Kaunakakai, horseback ride the spectacular coastline, take mule-drawn tours of coffee plantations, or hike the trails to Moaula Falls. Hike the rugged and beautiful Na Pali Coast on Kauai, and explore secluded coves and idyllic sandy beaches. Relax on Waikiki Beach, Oahu, probably the most famous sunning and surfing beach in the world. Learn to surf, parasail, or ride the waves on a surf outrigger or catamaran. If watersports aren’t your style, simply laze on the shining sand and people-watch in this tropical paradise. Tour Honolulu’s National Memorial Cemetery of the Pacific, also known as Punchbowl, a memorial and cemetery for US military veterans (https://www.cem.va.gov/). Visit Pearl Harbor (www.pearlharbormemorial.com) and the USS Arizona Memorial (www.nps.gov/usar), the scene of Japan's surprise attack that brought the USA into WWII. Free boat tours take visitors to the memorial, which spans the wreck of the Battleship Arizona where 1,177 sailors and marines lost their lives. Visit Wet'n' Wild Hawaii (www.wetnwildhawaii.com) on the leeward coast of Oahu to enjoy fun for all the family. The 12-hectare (30-acre) water park has waterslides, wave and river rafting pools, a play area, a food court, a video game arcade plus a swimming pool, hot tub, and bar for adults. Take a whale-watching cruise to Lanai from December to April. Once known as the 'Pineapple Isle,' Lanai is the perfect place for whale watching, as humpback whales make the waters around the island their winter breeding and calving grounds.